What's perhaps most notable about the smartphone device sales numbers is that Q4 2012 will be the first quarter than Lumia devices sales have exceeded Symbian device sales. It will also be the first quarter than the increase in Lumia device sales more than offsets the fall in Symbian devices sales. Nokia attributes the better than expected performance to a number of factors, including the Mobile Phone business unit and Lumia portfolio delivering better than expected results (i.e. greater sales) and lower than expected operating expenses. Nokia also mentioned a one-off IPR (patent) related income of €50 million, most likely a result of its recent agreement with RIM. Nokia also noted that Devices & Services net sales were approximately €3.9 billion, which is also better than expected, but is down from €5.9 billion in Q4 2011, reflecting the fact that Nokia is still facing challenging conditions and has lost a significant amount of market share in smartphones. During a conference control discussing the news, Stephen Elop noted that supply constraints had acted, and were continuing to act, as a "cap on [Windows Phone 8] Lumia sales" in all markets where the new products (Lumia 920 and 820) had been introduced. 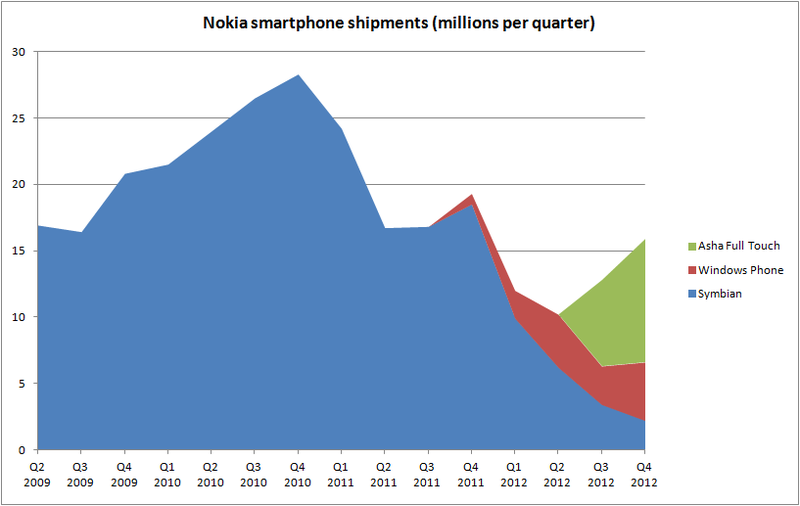 This suggests that the sales of the new Lumia products had exceeded Nokia's initial expectations. Nokia did not breakdown the 4.4 million Lumia sales into Windows Phone 7.5 and Windows 8 devices, but did indicate that it was Windows Phone 8 devices that had driven the majority of the Lumia's portfolio contribution to the better than expected results. In addition to the positive news from the Devices & Services division, Nokia Siemens Networks is also expected to report better than expected results, "delivering record underlying profits and a third consecutive quarter of underlying profitability". As a result of the news, Nokia shares are currently trading up 15%. Nokia's share price has increased 140% over the last six months, but still remains 16% down over the last 12 months. "We are pleased that Q4 2012 was a solid quarter where we exceeded expectations and delivered underlying profitability in Devices & Services and record underlying profitability in Nokia Siemens Networks. We focused on our priorities and as a result we sold a total of 14 million Asha smartphones and Lumia smartphones while managing our costs efficiently, and Nokia Siemens Networks delivered yet another very good quarter." Nokia also offered some prelimiary guidance for Q1 2013, indicating that seasonality (differences between quarters) and the competitive environment are expected to have a negative impact, with the Devices & Services division's non-IFRS operating margin expected to be negative 2 percent (+/- 4 percent). While this would be a decline from Q4, it is still better than many analysts and commentators were expecting. Nokia will publish its full Q4 2012 results on January 24th 2013.